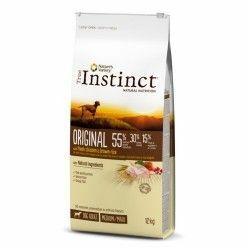 I think for adult dogs of True Instinct High Meat Medium – Maxi is a food that is formulated with a high percentage of meat which will help your pet to have a supply of energy extra. Is indicated for adult dogs of breeds large and medium-sized (dobermans, German shepherd, labrador,...) who perform an intense physical activity. Among his compositions, especially meat, with a 65% chicken to satisfy the nutrition of this type of animals. The I think natural True Instinct High Meat Medium-Maxi to maintain their high level of energy.